AUSTRALIA’S beaches are drowning in plastic. 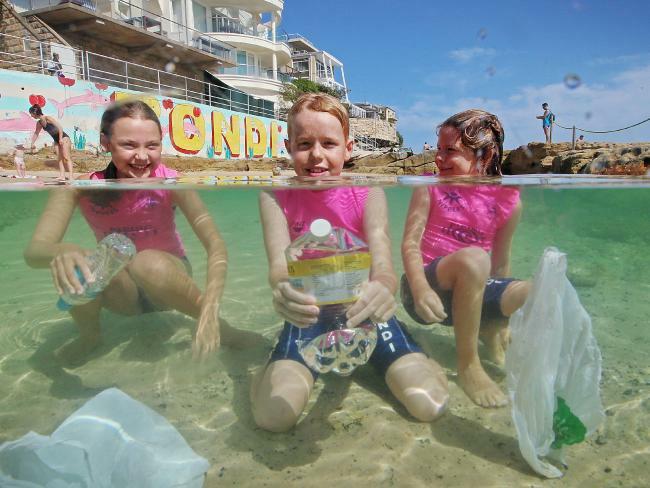 One of the worst plastic pollutants is the water bottle but Surf Life Saving NSW and Clean Oceans Australia have enlisted the Nippers to help rid the plastic scourge from the sands of some of Sydney’s most iconic beaches. “Three million PET (Polyethylene terephthalate) bottles and cans are being consumed every season at clubs around Australia, with none being recycled and that’s just the tip of the iceberg of how much plastic we’re seeing every day from all beach users,” Brett ­Pattinson, from Clean Oceans, said. The Clean Oceans Nippers program will be piloted across Surf Life Saving Clubs in Bondi, Coogee, Clovelly and North Cronulla. It will go national if it is considered successful. An estimated 15,000 plastic bottles are thrown away every minute in Australia and nearly three million bottles and cans are consumed per season at Surf Life Saving Clubs and events around Australia, and few are recycled. It is estimated more than 268,940 tonnes of plastic waste is floating in the Earth’s oceans with most generated from land via stormwater drains or careless littering. Bird and marine animals are dying as a result. Over 90 per cent of marine birds have plastic in their stomachs.